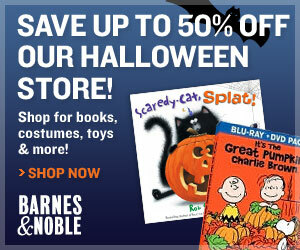 Barnes and Noble Halloween Book Sale! Barnes and Noble have always been one of the best places to shop when it comes to getting great deals on books. They're running a splendid 50% Halloween discount off kids costumes and books at the moment. If Halloween is a holiday you celebrate, this is a deal you won't be able to miss. But this is just the tip of the iceberg. This 50% discount doesn't end at just books. Halloween favourite books for adults and teens. Horror DVDs and scary movies galore! Make this a Barnes and Noble sale you grab with both hands because who knows when we'll see one like it again. Click here for more details. Thanks Anne for the info! My son has been invited to a couple of Halloween parties, so I have to find a costume for him by the end of this week..
Hi Anne, I love going to the book store and just spend all day in there if I could. Thanks for the sale tip.